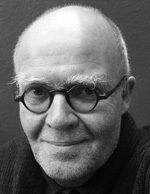 Wolf Erlbruch was born in 1948 in Wuppertal. He teaches graphic design and illustration techniques at the school of Fine Arts at University of Düsseldorf. He became famous as an illustrator of children’s books with De la petite taupe qui voulait savoir qui lui avait fait sur la tête. He has become one of the major figures of illustrations for young people. Editions La Joie de lire have had the privilege to publish several of his works. He has been awarded many prizes. Wolf Erlbruch lives with his wife and son Leonard in Wuppertal. There is no stranger encounter than that of a duck meeting Death. "Are you here to take me with you ?" asks the duck. Death does not really answer. Thus the discussion starts. The duck says he is worried about death. The two protagonists talk about this very serious subject. They have things to do together. The duck takes his "friend" to the pond and even offers to warm it. But the real question remains and the dialogue between the two characters continues without delivering an answer. One thing is certain : death is unavoidable. We are far from Erlbruch ’s collages. The duck is stylized, Death is nice and coquettish, and the backdrop is bare. The simplicity of the illustrations contrasts with the gravity of the subject that is discussed in a very tactful way. This book is a real masterpiece !